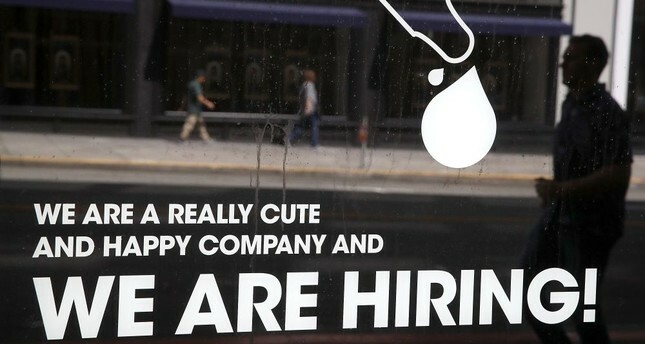 A sign posted on the window of a business in San Francisco, June 1. Hiring in the United States picked up in August as employers added a strong 201,000 jobs, a sign of confidence that consumers and businesses will keep spending despite the Trump administration's ongoing conflicts with its trading partners. The unemployment rate remained at 3.9 percent, near an 18-year low. Friday's August jobs report from the government also showed that paychecks are growing faster. Average hourly wages are now 2.9 percent above where they were a year earlier, the fastest year-over-year gain in eight years. Still, after adjusting for inflation, pay has been flat for the past year. Taken as a whole, the data point to a job market that remains resilient even after nearly a decade of economic expansion and even with the threat of tariffs and counter-tariffs on imports and exports looming over many U.S. employers that rely on global trade. The economy is expanding steadily, fueled by tax cuts, confident consumers, greater business investment in equipment and more government spending. Growth reached 4.2 percent at an annual rate in the April-June quarter, the fastest pace in four years. Even while reporting a robust job gain for August on Friday, the Labor Department revised sharply down its estimate of hiring in June and July. The government now says employers added a 50,000 fewer jobs in those two months combined than it had previously estimated. But the solid 201,000 job gain for August was nearly equal to the average gain of 196,000 over the prior 12 months, evidence of how steady job growth remains. Yet so far, those concerns don't appear to have depressed overall hiring. Businesses are increasingly reluctant to even lay off workers, in part because it would be difficult to replace them at a time when qualified job applicants have become harder to find. On Thursday, the government said the number of people seeking unemployment benefits — a proxy for layoffs — amounted to just 203,000 last week, the fewest total in 49 years.